Click the window to see the outside (1). Take the medal from the bag (2) (bottom right corner), and put it to the food position (3) four times. Click the skeleton to climb up the jail (4). Fetch the bread from the position (1) to your bag. Take the bread from the bag (2) and put it into the position (3). Get the key from the monster's hand. Take the key from the bag and use it in the door (4). Click the black cat (1). Click the stone coffin (1). Get the stone wheel from (1). Take the stone wheel from the bag and use it in (2). Solve the puzzle, rotate all of the four stone wheels to match the coffin. Take the blanket of invisibility (1). Use the blanket of invisibility twice at position (2) and (3). The guards will turn off the light. Click the upstair to go. When the guards rush in, then click the switch (1) to turn off the light, all of the guards will fall down. Click the top or bottom of the princess, when the monster attack her. You should jump or squat 3 times, and turn off the light (1) before the monster throw all of the monkeys. 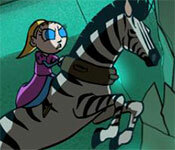 Tsioque Full Game Walkthrough: click to start Tsioque Full Game Walkthrough Download. Sign-up to get informed when the Tsioque Full Game series has new game released with BD Studio Games' FREE bi-weekly newsletter.